ASHEVILLE- The Asheville Tourists are one of the top offensive teams in the South Atlantic League and the individual honors continue to come their way. 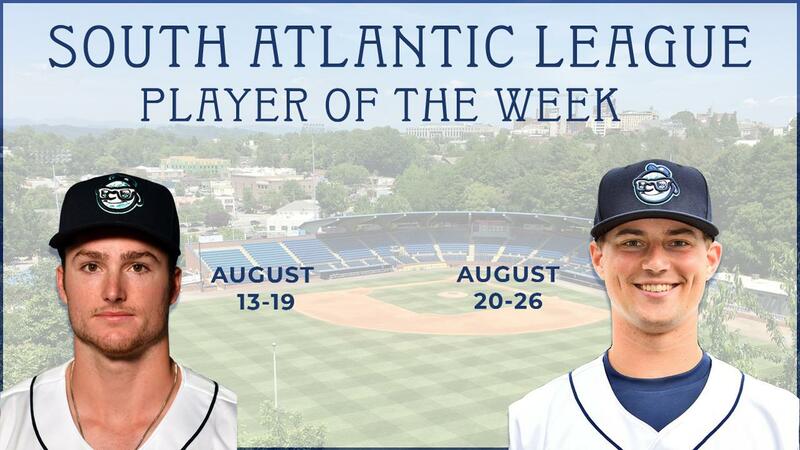 From August 13-19, Casey Golden was named the SAL Player of the Week. Todd Czinege continued the Tourists' reign by winning his first Player of the Week Award during the week of August 20-26. Golden, who was named the South Atlantic League MVP, hit .458 during the week of August 13-19. Casey went 11-for-24 with three doubles, one triple, and two Home Runs. Asheville's outfielder recorded eight RBI and scored six runs while also adding a walk and a stolen base to the mix. Czinege, the former Villanova Wildcat, received the recognition for his performance last week. Czinege has done nothing but hit since he arrived in Asheville at the beginning of July. Todd is batting .325 in 42 games with the Tourists and has hit 12 Home Runs, 11 doubles, and a pair of triples. During the week of August 20-26, the right-handed hitter went 8-for-23, a .348 batting average, hit four Home Runs, drove in eight, and scored six times. Czinege is batting .417 over his last nine games and has six Home Runs during that stretch. Previous Player of the Week Asheville award winners in 2018 include Bret Boswell and Chad Spanberger (twice). The Asheville Tourists finish out the regular season at home with a four-game series that begins on Friday, August 31.